Apart from esoteric realm of Tańtras, we find the testements of Devī as 'Ādyā' in Purāņas as well. The Śākta doctrine documented in Purāņas is primarily based upon Sāńkhya philosophy's concepts of Puruşā and Prakřti; however, the theories of duality of Sāńkhya and existence of multiple Puruşas are rejected here. Śākta Purāņas rather adopt Advaitic (monistic) approach and conceptualise Prakřti and Puruşa to be one and indistinct. Thus, Prakřti in Śākta Purāņas is not gross; rather She is Divine and Her essence is truth, consciousness and bliss. 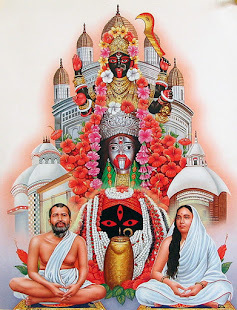 In other words, She is Brahman, who is both Saguņa as well as Nirguņa. Mahābhāgavata Purāņa or Śākta Mahābhāgavatam is a Śākta Upapurāņa, where we find the anecdote of the birth of Brahmā, Vişņu and Śiva from Mahākālī. Before creation there were no sun, moon or other celestial bodies and hence there were no distinctions between day or night or the cardinal directions. Even the senses were then non-existent. At that time, the one who existed was that Mahākālī, who alone is Brahman. She is the eternal Brahmavidya, who is unexplainable, blemishless, rare even to the Yogins, all pervading and self-content. When formless Mahākālī desired to create, at that time She assumed an incredeble form. This form has complexion of split-coryllium and Her lotus-like smilling face is full of bliss. She is four-armed, holding a sword & a lotus while displaying Varadā & Abhaya Mudrās, and three blood-shot eyes & flowing hair. Her breasts are firm and She sits on a lion. Having manifested Herself thus, Mahākālī produced Puruşa. Seeing Him unconscious, Mahākālī infused Her energy into Puruşa and thus animated Him. 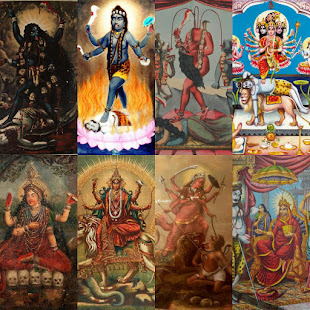 He then assumed three-fold forms of Brahmā, Vişņu and Śiva. 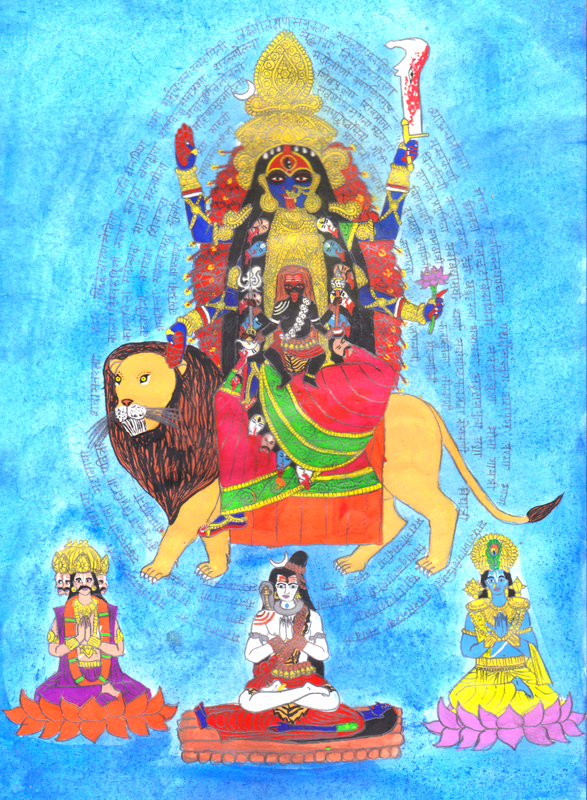 Seeing the work of creation yet incomplete, Mahākālī produced Jīva and Parama from Puruşa while She Herself produced Māyā, Paramā and Vidyā. From Her third limb known as Vidyā, Mahākālī produced Gańgā, Durgā, Sāvitrī, Lakşmī and Sarasvatī. Thereafter, Mahākālī directed the Tridevas to perform the duties of creation, preservation & dissolution and disappeared from there. Brahmā then created ocean, and the Tridevas began to perform austerities to appease Mahākālī. To test the three Gods, Mahākālī assumed a terrifying form and appeared before the three. Seeing the horrible form fiery like the fire of dissolution, Brahmā began banging his head in four directions, only to see Mahākālī pervading every direction. Vişņu out of fear shut his eyes and plunged into the ocean. However, Śiva recognised Mahākālī but remained steedfast in His meditation. Appeased, Mahākālī desired to grant Śiva His choicest boon. 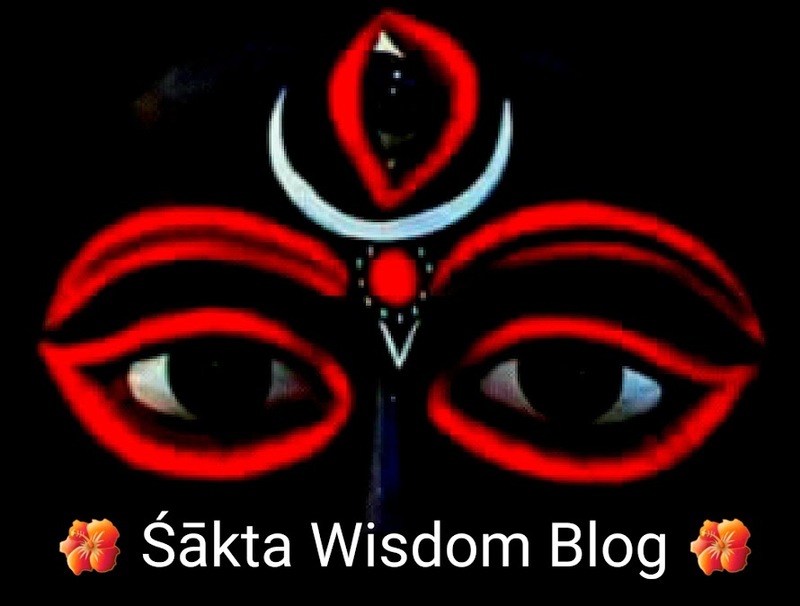 At this, Śiva asked Mahākālī to bestow upon Him a consort, who would be a portion of Devī Herself just like Lakşmī and Sāvitrī. Thus, a portion of Mahākālī incarnated as Dakşa's daughter Satī and united with Śiva. नमस्तस्यै नमस्तस्यै नमस्तस्यै नमो नमः ॥"
Kālī is beginning, Kālī is end; everything originates from Kālī, and finally rests in Her as well. Thus, I salute that Ādyā Kālikā, who inspired me to post this series. May Ādyā Kālī impell us towards the Highest Truth.